The August Smart Lock is not new. We reviewed it way back in 2014, and for the most part, everything we mentioned then still applies. The lock is still super easy to install, and it still works with deadbolts, not knobs. Most importantly, using an app instead of physical keys can still be an adjustment, but being able to control your lock remotely really is an interesting convenience. So why bother revisiting, then? Because two years post-launch, it's finally been upgraded with HomeKit integration. Since Engadget hasn't actually tested many HomeKit devices yet, we thought this one was worth a second look. For those not in the know (this won't be many of you), HomeKit is a home automation framework created by Apple that developers can use to send data across applications and devices. It means that information from your thermostat, light switches, lightbulbs, blinds, locks and other smart-home devices can be shared using a common standard and with approved security practices. For now, the only way to interact with HomeKit is through Siri, but rumors suggest that the system may soon be getting a dedicated app. In the case of the Smart Lock, upgrading to HomeKit actually means buying a new device; the hardware differs slightly from the original model introduced two years ago. Thanks to HomeKit, one can control the August Smart Lock by speaking to the phone and saying things like "Close the door" or "Is the back door open?" and have it react accordingly. This is precisely what technology is supposed to do: make our lives easier. Am I lazy for opening my door from the couch? Maybe, but I'm fairly certain most people would do it if they had the option. 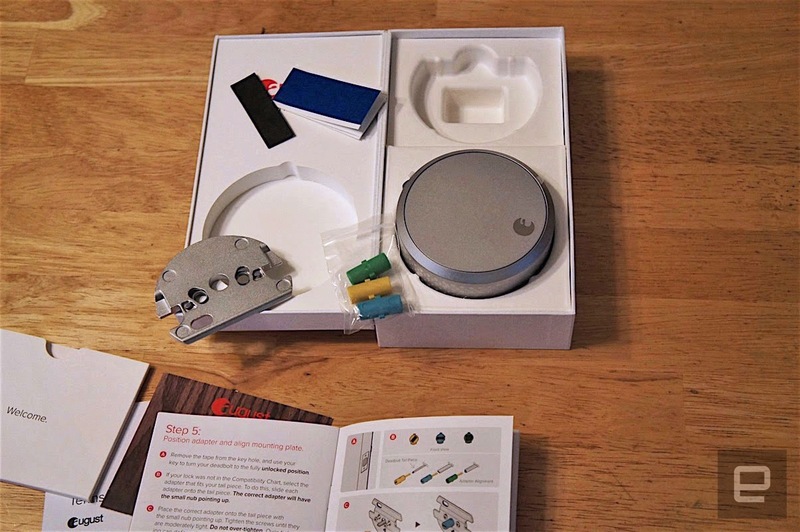 Regarding the installation, well, there's no need to repeat all the instructions from our original review, but basically, you mount a plate to the door, adjust it according to the deadbolt's brand and mount the Smart Lock to the plate. If you've ever installed a doorknob before, this shouldn't take you too long, and the instructions are easy to follow. I'll focus instead on the integration with HomeKit, which was fairly painless to configure. Just open the August app, select the option to set up Siri, scan the code included with the lock and... that's it. After tapping through four screens and waiting a few seconds, my phone was ready to use the smart lock as a HomeKit device. Once the initial excitement of having a smart lock wore off, I had a hard time getting used to the idea of using my phone to unlock the door. For more than 30 years, I have trained my brain to use a key, and honestly, pulling your phone from your pocket, unlocking it, finding the right application, connecting to the lock and clicking the button takes much longer than the old-fashioned key-in-hole process. However, asking Siri to open the door is in fact faster and more convenient, especially if you're already wearing headphones with a button. In addition, August offers geofencing, which means the door will open when I'm nearby. After enabling this feature, I didn't mind my wife telling me she knew when I got home from work because the door unlocked itself. What bothered me was the admittedly unfounded idea of the lock misidentifying somebody else's device and opening the door. So, I disabled the functionality. I'm no security expert and haven't researched possible vulnerabilities with the August Smart Lock, so I'll refrain from weighing in there. What we do know is that door locks in general are not safe to begin with. Lock-picking can be learned in a few minutes watching YouTube videos and with some practice one can get really good at it. The fact is, if somebody really wants to get into my house, they can just disable the alarms, break a window and steal my outdated TV. So, hacking the lock should not really be a worry, even though it's the first question I get asked when I show August off to my friends. While I enjoy checking the lock's status from the couch, my mother, who is staying with us for a few weeks, doesn't find it convenient. She doesn't like speaking to Siri to begin with, and pulling up the app is a hassle. Also, I wasn't aware my wife hadn't been using the back door for a few days because she didn't have the phone with her. It was my mistake not explaining that the Smart Lock can be opened by hand. After I saw her avoiding the back door I realized I hadn't properly explained how to use the app. I mention this to demonstrate that we still have to get used to home automation, and retraining everyone is not an easy task. If the August Smart Lock looked more like a regular lock, maybe people would be more keen on using it. After a few weeks using the August Smart Lock, I must say it's a great product. I love it, just not enough to pay $200 to replace a perfectly good old-fashioned deadbolt. It works great, is convenient, and it looks futuristic. I would even consider installing one permanently if it didn't cost so much. The fact is, I have been unable to sell the product to my wife, who makes most of the purchases for our home. While doing some informal polling among my friends about whether or not they would use this smart lock, the answers varied. Money was not a huge concern, but security was. Can somebody else use it if they have my phone? Yes, but also they can open your door with your keys. Can August or somebody else use it to track me? Can it be hacked to be controlled remotely? Does it leak information inadvertently? Those are questions that I hope the security community can answer in a timely fashion. People might be wary of using smart locks because humans have been using regular locks and keys for hundreds of years, and they mostly work OK. This new class of device could be a tough sell, if only because we're afraid of new things. Regardless, for people like me and you (you are interested in technology, aren't you? 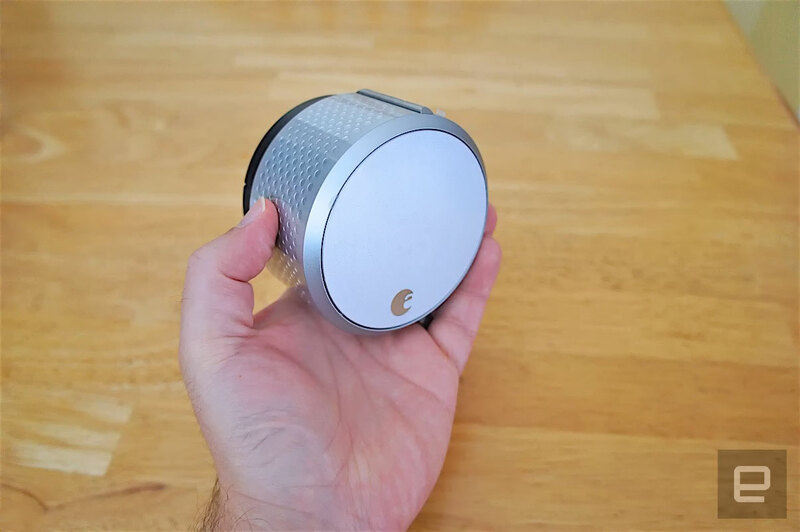 ), the August Smart Lock is great because it works as an extension to old locks, offering added convenience. The addition of HomeKit makes the Smart Lock even more user friendly than before. 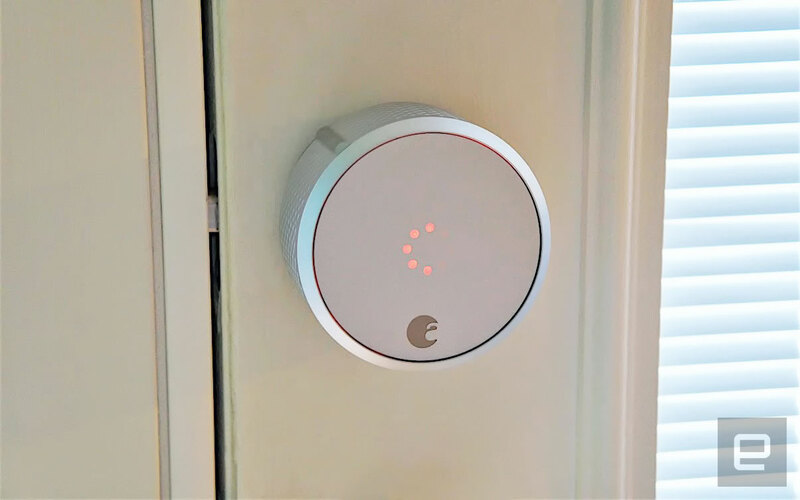 Considering the integration with partners such as AirBnB, I can see a bright future for smart locks, if companies like August are able to educate more people about the benefits.